Pity the nation that is full of beliefs and emty of religion. "The art--or craft--of reporting in Lebanon was being debased by a style of writing that reduced complex and tragic events to a common denominator which both insulted the victims and mocked their suffering. Television journalism, with its dependence on the image, its subordination of words to pictures, contributed to this process. So did radio journalism, especially in America where a 35-second time limit is normally imposed on each foreign report. The news agencies--which catered for radio and television as well as newspapers--helped to create the unreal world in which the crisis was framed. I began to suspect that the cliches that governed so many reports and headlines about Lebanon actively hindered our task to telling the truth about what was happenning there." Some examples: Syrian weapons were always described as "Soviet-made", while Israeli or Phalangist weapons were never described as "American-made". Israel "captured" people, while Hezbollah and the PLO "kidnapped" them, and Israel-occupied Lebanon was described as a "security zone." Fisk also has an excellent section on the use and abuse of the word "terror" and "terrorism", that helps contextualize much of the current overheated rhetoric on this misunderstood concept. For if it is terrorism for Palestinians to fire rockets over the border at Israeli civilians, then surely it is terrorism when Israel bombs entire apartment buildings, killing everyone inside. Surely it is terrorism when the US incurs over the Syrian border chasing an al-Qaeda operative and kills civilians in a village. 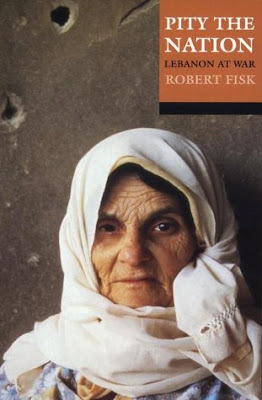 Fisk and other journalists on the ground in Beirut actually began to refuse to use the word in their reports. Better to call an "attack" simply an "attack" and avoid the emotional bias of the word "terror" as a descriptor. I could go on with insightful examples from this remarkable book. But instead, you yourself, should go out and get a cheap copy and read it.